At just after 0430 on the morning of the 28th of October, 1915, the Royal Navy armoured cruiser HMS Argyll ran aground on the treacherous reef by the Bell Rock Lighthouse and was wrecked. That was one hundred years ago today. The Argyll had been undergoing a refit at Plymouth and was on her way to rejoin her squadron at Rosyth. Because of the danger of German U-boats in the North Sea, she was making her way the long way around – clockwise around the coast, through the Irish Sea, through the Pentland Firth, then south towards the Firth of Forth and the rest of the fleet. The seas were stormy, with fog and driving rain, so the captain, James Tancred, sent a message to Rosyth asking for the Bell Rock Lighthouse to be switched on. In wartime, the lights were used only for emergencies, or on pre-arranged occasions, so they wouldn’t provide any help to the enemy. The lighthouse didn’t have a radio, but Rosyth promised Captain Tancred that they’d get a message through. First they tried a motor torpedo boat, but it couldn’t even get out of the Firth of Forth, the seas were so huge. Next, Rosyth asked the battleship HMS Queen Mary to pass on the message – but the Queen Mary, too, was unable to get through due to the heavy seas. The Queen Mary passed on her regrets to Rosyth – but crucially, no-one passed this message on to the Argyll. HMS Argyll continued racing through the night and the storm, looking for the light that wasn’t there, completely oblivious to the dark rocks lying hidden ahead. 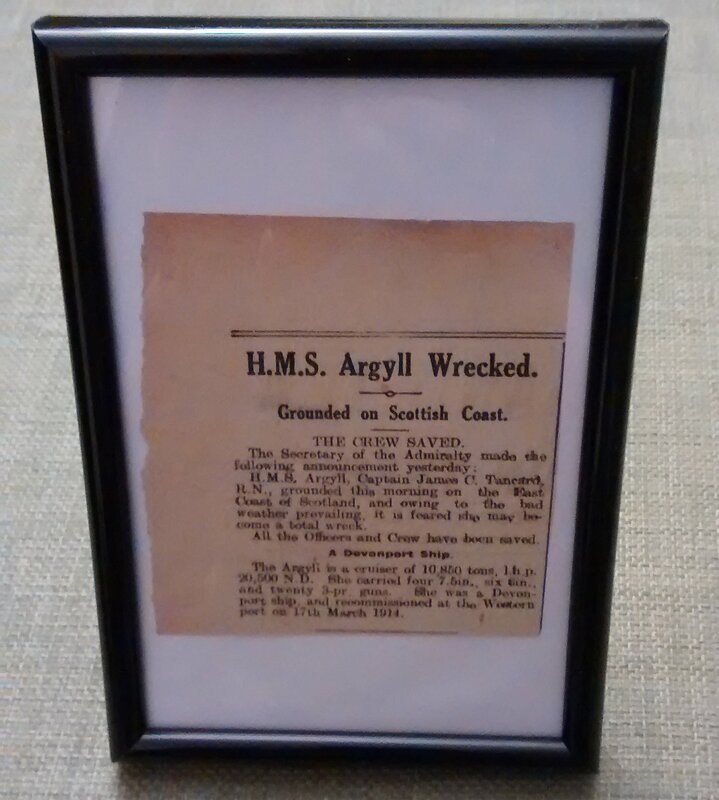 When I first found out about the wreck of the Argyll, I realised that I’d found my story – my Great War Dundee story. The Bell Rock is only a few miles from Dundee, and in fact the first report I found said that the Argyll was wrecked “off the coast of Dundee”. It was the perfect real-life event on which I could base my book. What made it even better was it combined drama and danger with a happy outcome – while the ship was wrecked, every member of the crew was rescued. I could definitely use that! In fact, the only injury was one sprained ankle. I’ve probably given away too many spoilers for my book, so (in the tradition of Douglas Adams) I’ll leave the mystery of exactly who gets a sprained ankle as something for you to discover. 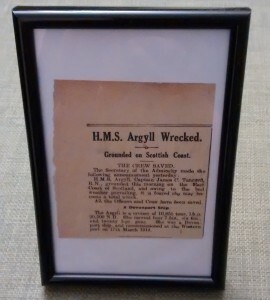 But of course, the wreck of the Argyll is only half the story. The other half of my book centres on my young detectives Nancy Caird and Jamie Balfour, and their determination to track down a German spy. Because no matter how exciting and dramatic history can be, there’s no reason not to spice it up a little bit more with spies and intrigue! Nancy and Jamie are the heart of The Wreck of the Argyll, and their adventures in Dundee and Arbroath were every bit as exciting for me to write about as the real-life events on board ship. And I won’t be giving away any spoilers for that – suffice to say that they encounter espionage, secrets, and betrayal, and discover that no-one is as they seem, and no-one can be trusted.